In the early 1970s, gas chromatography-mass spectrometry (GC-MS) was first introduced as a diagnostic technique for human urine metabolic profiling. Since 2000, publications utilizing GC-MS in metabolomics are rapidly increasing. GC-MS based metabolite profiling of biological samples has become one of the key technologies for metabolic profiling and substantially contributes to our understanding of the metabolome. Nowadays, with a growing popularity of high resolution accurate mass (HRAM) GC-MS, the GC-Orbitrap – rapidly becoming the new paradigm among all HRAM systems – significantly improves both targeted and untargeted metabolic profiling due to its unrivaled resolution and excellent mass accuracy. The key challenge of metabolic profiling is the rapid, reliable, and unambiguous identification of hundreds of metabolites in highly complex matrices. A well-refined and curated mass spectral library can profoundly aid in the identification of putative metabolites flagged during profiling experiments. The first commercially available Orbitrap GC-MS HRAM Metabolomics mass spectral library for electron ionization (EI) was released in 2017. Since its successful initial release, version 2.0 has been extensively updated to over 1,000 retention indexed accurate mass spectra from more than 920 unique metabolites including chemical structure, standardized chemical name, InChIKey, PubChemCID, CAS Registry number, exact mass, experimental retention index (RI), native metabolite information, instrument method, and contributor. It provides an extensive coverage of primary and secondary metabolites (including volatiles) in humans, animals, plants, and microbes. Two general approaches exist in metabolic profiling: targeted and non-targeted. The targeted approach identifies and quantifies select known metabolites, which are characterized by their mass spectra and retention indices, and allows the fast and easy construction of the data matrix. 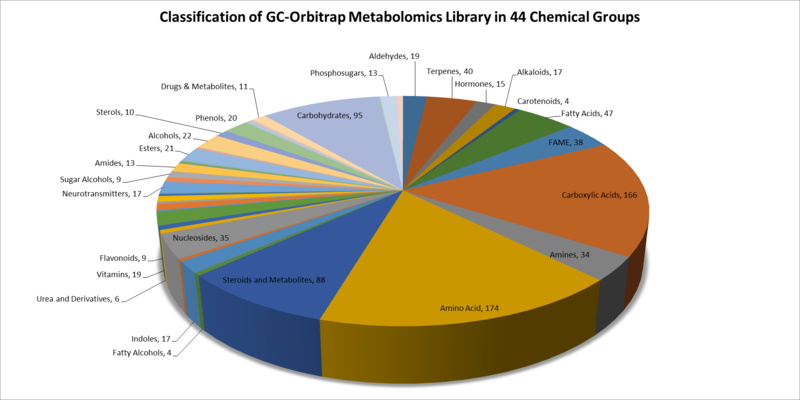 The new comprehensive Compound Database (CDB) was built based on version 2.0 of the Orbitrap GC-MS HRAM Metabolomics Library. It can be rapidly implemented into TraceFinder Software to generate a full-scan targeted screening or quantitation processing method. It also supports a customizable set-up of metabolite screening based on 44 chemical categories. At least five theoretical exact masses of major ions were selected with retention times for each metabolite in this CDB, which increases the confidence of targeted screening. In contrast, the challenge of untargeted metabolic profiling comes from the complexity of biofluids, which are composed of a wide range of metabolites that need to be identified. Thus, a comprehensive database is imperative to improve the identification of metabolites in order to characterize the metabolic pathways they take part in. Identification with version 2.0 of the Orbitrap GC-MS HRAM Metabolomics Library is based on searching acquired metabolites’ accurate mass spectra and RIs against the library. Typically, on a mass acquired on the Orbitrap only a small variation in the fourth decimal place is seen as compared to the theoretical mass of the library hit, which can considerably increase confidence in each metabolite identification. In addition, retention indexing in the library is extremely useful to differentiate geometrical isomers or confirm metabolites when their mass spectra are quite similar. Fully automated peak detection, deconvolution, and library search against reference spectra can be achieved using TraceFinder Deconvolution software coupled with the Orbitrap GC-MS HRAM Metabolomics Library. 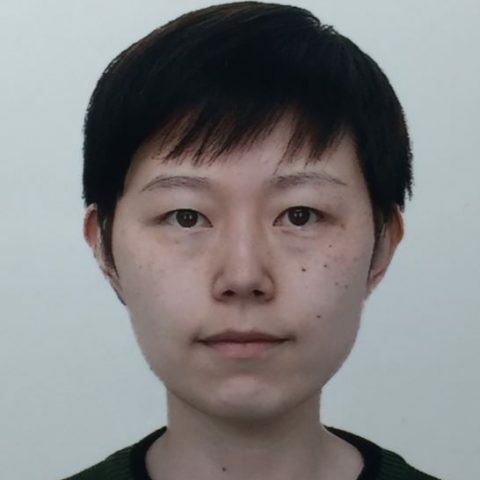 It is highly sensitive and selective software for peak deconvolution and identification. As we all know, mass spectral match alone is sometimes insufficient for identification. This is especially true for isomeric identification, thus RI matching is a typical way for confirmation. The TraceFinder deconvolution software automatically calculates RI values for unknowns and matches them with library values. Also, a column polarity of each RI value will be pulled from the library for unambiguous comparison. A total score is used to rank the library hit that includes weighting from the search index score (SI) and the high resolution filtering (HRF) score that is developed for HRAM data. The higher the total score, the more confident the identification. All ions are annotated in an extracted ion overlay window and can be added into a user-created compound database. Spectra for new metabolites can also be easily added into user-created libraries using the software. A high-quality and well-curated GC-MS library is an essential tool to decrease workload and increase confident identifications for bench-chemists. More and more critical metabolites that likely would have been missed in the past due to lack of reference spectra can be confidently identified using GC-Orbitrap with its high-quality HRAM Metabolomics Library, which continues to be developed to facilitate both targeted and non-targeted metabolic profiling. Hi Blaise, we'd be happy to share more information with you. Is there something specific you'd like to find out more about?